It was hard to miss ADJ’s booth at the recent NAMM show in Anaheim, CA. Its lighting and video display attracted a steady stream of visitors who kept the ADJ team busy demonstrating products and answering questions throughout the whole four-day exhibition. 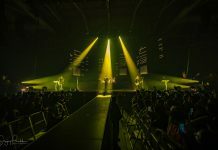 Seven brand new products were exclusively launched at the event, while over 300 of ADJ’s most popular lighting fixtures and LED video panels were showcased in an impressive rig. A time-coded light show set to music entertained visitors at regular intervals, which never failed to draw in a sizable crowd, while other products were displayed on plinths to allow visitors the chance to see them up close. 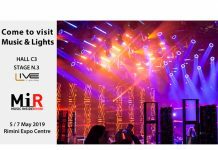 However it wasn’t only the company’s own booth that was lit up by ADJ lighting, hundreds of other fixtures could be found elsewhere around the show enhancing the displays of other exhibitors. ADJ’s Design Series video panels provided an eye-catching design feature for the booth of musical instrument distributor KHS America. In the Sonor drums section, six separate portrait pairs of DS4 square panel sections were spaced out across the back wall. These allowed the Sonor logo to be displayed with one character per section, interspersed with video clips displayed across all 12 panels used as a single screen. Over on the Hohner section of the booth, two small screens and one large central display were interspersed with backlit still photographs that filled the back wall. 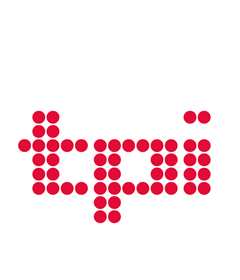 With a mixture of static logos, text, images and video footage playing on the panels, this gave the impression on first glance that the whole wall was filled with video screens. All of the Design Series LED panels featured on the booth were provided by David Jacobi of Cobico Productions who invested in a large inventory of the product last year and has already been hired to supply video walls in a wide range of different shapes and sizes for a variety of high profile events. Pioneer DJ recently invested in an assortment of ADJ’s lighting fixtures for demonstrating its rekordbox dj Lighting Mode and RB-DMX1 interface, which provides easy synchronization between a DJ’s music and their light show. On the company’s NAMM booth four 5P Hex LED par fixtures were positioned above each of the rekordbox dj Lighting Mode display stations demonstrating colour changing chases synchronized to the music played on accompanying DJ controllers. For showcases on the booth’s main stage, a rig comprising eight 5P Hex pars, four UB6H LED battens and four Inno Pocket Wash moving heads were utilized, rigged to truss podiums positioned at either side of the booth. Drumhead manufacturer Remo wanted to make its trade show booths really stand out using LED lighting, so visited ADJ Product Specialist Jake Rhodes and Sales Executive Ernie Baez at the company’s LA HQ for advice. Jake & Ernie helped design and specify a modular system built from Global Truss America trussing and illuminated with ADJ lighting that can be used in smaller layouts at regional shows but was used in its full form at NAMM. It features a floor-standing truss structure warmed by a total of 24 Mega Hex Par fixtures with four COB Cannon Wash units providing vibrant illumination of logo banners positioned on each side of the booth. Four 12PX Hex pars and 13 Saber Spot WW fixtures rigged to the truss then provided illumination for the various exhibits spread across the stand. An Airstream DMX Bridge, connected to a D6 Branch for distribution of the DMX signal across the truss structure, allowed control of the whole booth from an iPad. Finally, completing the vibrant display, an Ikon Profile projected a custom Remo logo GOBO on the floor in the middle of the booth. 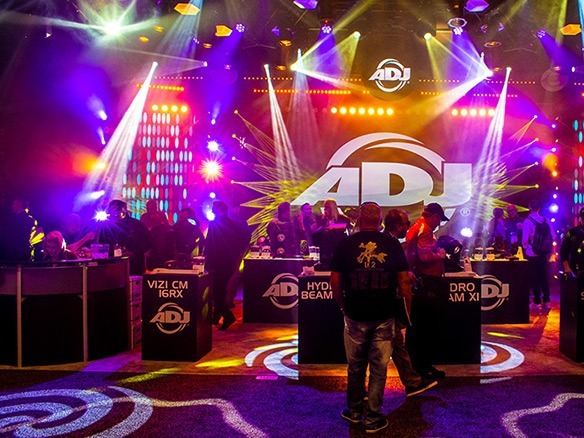 The designer of Roland’s sizable booth selected ADJ’s Dotz Matrix as the sole lighting fixture for providing both ambient lighting and eye-candy effects. Featuring a 4 x 4 matrix of powerful COB RGB LEDs, this vibrant fixture offers full-colour mixing and individual pixel mapping which allows for the creation of a wide variety of impressive effects. More than 40 of the units were evenly spaced above the stand, pointing directly down at the floor and set to run a subtle pattern that provided both illumination and atmosphere. 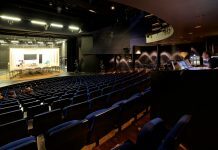 In addition, two stacks of five fixtures were mounted facing outwards at either side of the stand’s main stage to provide more energetic pixel effects to complement the eclectic line-up of musical performances that took place throughout the four days of the show.